Only 80 yards from the main house, it has it's own private driveway, kitchen, and is completely independent of the Sunset Cottage if needed. OR, it's just a quick 45 second walk to the main house where you can share your vacation with the rest of the party. Located in the Sabino summer community area of West Bath, this property is a true destination property. 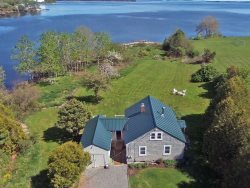 However, world-famous Popham Beach, Freeport shopping, and downtown historic downtown Bath are all just minutes away – if you can pry yourself away from the waterfront views. Outside, kayaking and swimming from the dock is sure to be fun. The young ones in the groups will enjoy finding treasures along the shore at low tide. Site of the Popham Colony, Phippsburg was between 1607 and 1608 the first English settlement attempted in New England. Popham Beach is in Phippsburg where it is routinely recognized as one of the best beaches in the entire USA. If it isn't the best, it is certainly the least visted - with lots of room to stretch out. West Bath neighbors Popham Beach and Westport Island is just to the north.